Francine's Friends: WLDE Carrie Wellman Chats with "Friends"
We love our "friends" around town who always take time to chat with us - to find out what's new, what's coming up, and to help us create more awareness of the importance of early detection in the fight against breast cancer. One of our long-time friends (since the beginning!) is Carrie Wellman of Fun 101.7 WLDE Classic Hits. Carrie and her crew was the first ever to do a live remote from the coach (complete with the Weenie Wagon! ); helping us to get the word out about the new Francine's Friends mobile mammography coach back in 2005. Carrie recently chatted with Board President Sharon Simmons and board member Donna Emley - about our upcoming "Lunch with Friends" on October 14th, our capital campaign to purchase a new coach, and the ease, convenience and time-savings of having your mammogram on the coach. 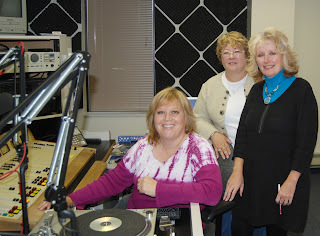 Tune in to hear them on Sunday, October 9, 2011 on "Fort Wayne Feedback" with Carrie at 101.7 WLDE. Thanks Carrie!